I bet you must have attended a party. In this case, you deserve to make up, wear beautiful clothes and choose shiny necklace in order to highlight yourself. However, so many women are always concerned that they are lack of a suitable necklace to match a dress. Good recommendations are given here for you! Look at the square bead necklace and the silver choker collar necklace next. With 3 layers of square beads, the square bead necklace looks glowing very much. There are 5 colors for you to choose totally: red, yellow, purple, white, black. Each of color gives you different feelings and you can select one according to clothes in your wardrobe. You must have found its pendant is obvious enough to capture others’ attention in a party. The latest fashion trend shows that square beads may become one of the most popular elements in this summer. So, why not choose a square bead necklace to model a stylish self in a party? 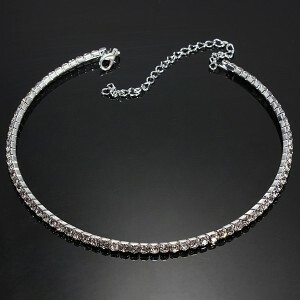 If you prefer to something dazzling, the silver choker collar necklace is designed for your demand. 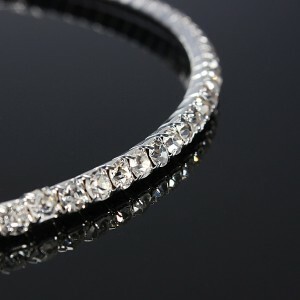 It is easy to be caught by the bright luster as the necklace is really glaring. When you wear it on your neck, you can turn into a noble princess at once. It makes a contribution to beautifying your clavicle, making you look more exquisite! Most clients all speak highly of it, saying that it is the best decoration for an upscale dress. Suggestion is given that you should prepare at least one delicate necklace in your casket whether you like the square bead necklace and the silver choker collar necklace or not. 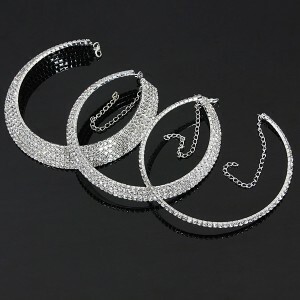 As a fashionable modern woman, you have to realize the significance of wonderful jewelry. It seems this one very siutable for night party cuz it is dazzling.